He didn’t seem to see me, I noted, even though he sat directly across the metal table from me. His hands were attached to a ring on the table via metal cuffs, but he ignored how the bracelets tugged at his hands when he rocked back in his chair. Dr. Angell’s eyes briefly focused on me, but then they darted off again as he kept on rocking back and forth, now muttering indistinctly to himself. He always did eventually come around, but as of late it seemed to take longer and longer. His mind’s grip on reality, the doctors at the sanitarium said, was slowly slipping away. I didn’t know how much longer I had before he’d lose that tenuous grip and fully slip away. Finally, Dr. Angell seemed to come back to himself. His rocking slowed, and his eyes finally focused on me. “Francis?” he repeated, his voice quavering. Slowly, unsteadily, Dr. Angell nodded his head. “How long has it been?” he asked, his voice barely above a broken whisper. “Six months,” I told him gently. I didn’t lie. Even as little more than a broken shell, Dr. Angell deserved the truth. “Six months,” he repeated, shaking his head. “Oh Francis, I don’t know how much more of this I can take. I can feel them hungering. They lurk, they wait, but not for much longer. They’ll break through when I give in, and I’m so tired!” He sagged back on the chair, dropping his eyes down to stare at his lap. “So very tired,” he murmured to himself. “Beat it! ?” Dr. Angell shouted back at me, suddenly bursting up to his feet. Only the metal handcuffs binding his wrists to the table kept him from rising up fully, and the whole metal table shook. Even after six months of wasting away in this sanitarium, Doctor George Angell still possessed his broad shoulders and powerful frame. I did my best to not show any hint of panic at the outburst. “Talk to me, George,” I repeated. I nodded, not interrupting. Before his sudden commitment to the sanitarium, Dr. Angell had been one of the best known and most respected astronomers. His work on documenting the slow burnout of the stars around us had been featured many times in the tabloids. At these last words, Dr. Angell gasped, and I could sense that he was on the brink of losing all control. “They? They who?” I repeated, trying to keep him in the realm of lucidity. I waited, even tried again, but Dr. Angell didn’t speak again for the rest of the visiting hour. No amount of prodding or cajoling from me could bring him back from his half-paralyzed muttering. Finally, after the orderlies had taken him away to his room, I stood outside, my hands shoved deep into the pockets of my overcoat to protect against the chill. The sun had dropped below the horizon, now, and stars lit up the sky. I nodded, told them to do whatever they could. I tried to keep a note of hope in my voice, although I knew as well as the head nurse that there was nothing they could do. Dr. Angell stood no chance. Now, outside, I stared up at the stars. Even without the powerful telescope of the observatory, I could see their different colors, could make out the glow of the Milky Way in a band across the sky. My eyes scrolled across the black dome above me, automatically noting the familiar landmarks of Polaris, Mars, the Seven Sisters, Orion’s belt, and others. Suddenly, I paused, frowning. There, just between Orion and Gemini, a reddish blotch glowed faintly against the darkness. There was a nebula there, I knew, but it was usually too faint to see with the naked eye. Staring up into the sky, for just an instant, my mind’s eye filled with a long finger, stretching out across millions of miles, stabbing out with unthinking hatred towards that puny mind that dared to touch it. 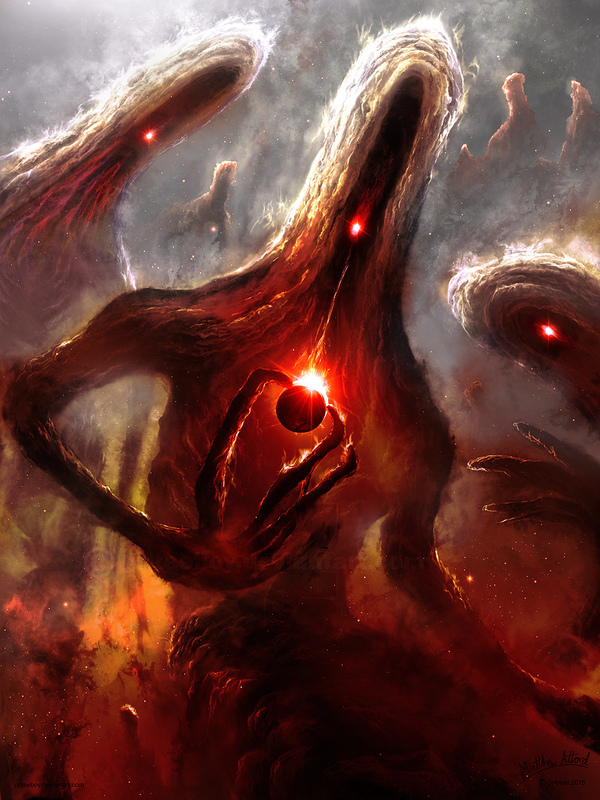 I saw a huge creature, a gaseous body stretching across a galaxy, a mind so ancient and cold as to be frozen over. I imagined that I felt hatred, cold and reptilian, seeking to consume all light and warmth, an ocean swallowing the light of a candle. “It will consume it all,” George had babbled, before he collapsed into senselessness. As I walked home, most of my mind focused on composing my report to the Royal Guild of Astronomers on the unfortunate fate of the man who was once one of their most prominent members. It would be a difficult report for me to deliver, but as Dr. Angell’s protege, I knew the duty was mine and mine alone. Still, a tiny little part of me wondered about his last, mad rantings. Surely, they were nothing but madness. But I resolved to spend some time on the main telescope, turning it towards that reddish nebula that now glowed faintly but unmistakably in the night sky.